Black-and-white photo of a stop sign. "Anyone who engages in risky sexual behavior can get a sexually transmitted disease. Anyone can get the AIDS cirus the same way. Poeple with gonorrhea, herpes, or syphilis got a warning. Hope they paid attention. 1-800-342-AIDS. For the hearing impaired, 1-800-AIDS-TTY." Stop sign image. Black & white. Information about STDs. Bent into 1/4 mc. Marker upper right corner. 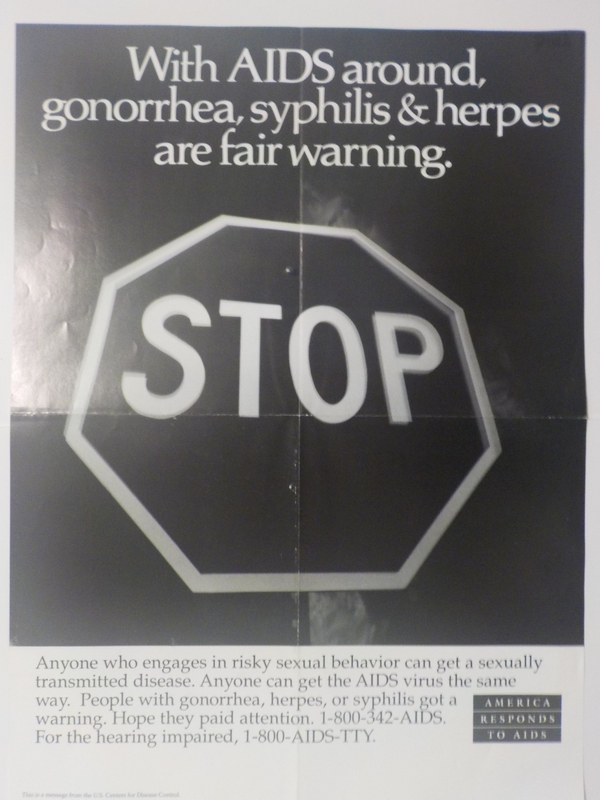 "This poster pictures a stop sign serving as a warning against engaging in risky sexual behavior. The text discusses the relationship between AIDS and and other sexually transmitted diseases." - CDC National AIDS Clearinghouse, Catalog of HIV and AIDS education and prevention materials September 1994, p. 21, Order number: P125. BMC Public Health. 2011; 11:955.